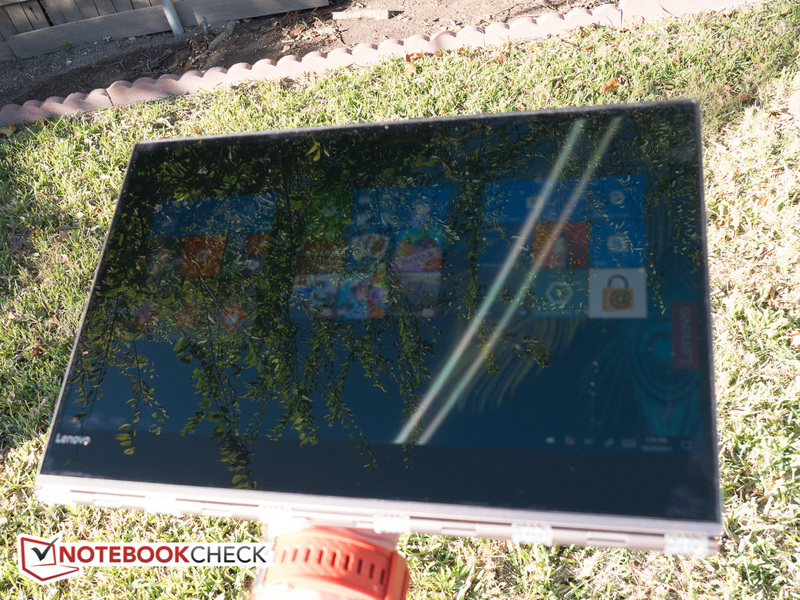 At the end of last year we reviewed the Lenovo Yoga 910 and came away pretty impressed: while not exactly inexpensive, the company's premium consumer convertible with its visually distinctive watchband hinge ticked many of the right check boxes: upscale narrow-bezel aluminum design, good performance, and a strong battery life. 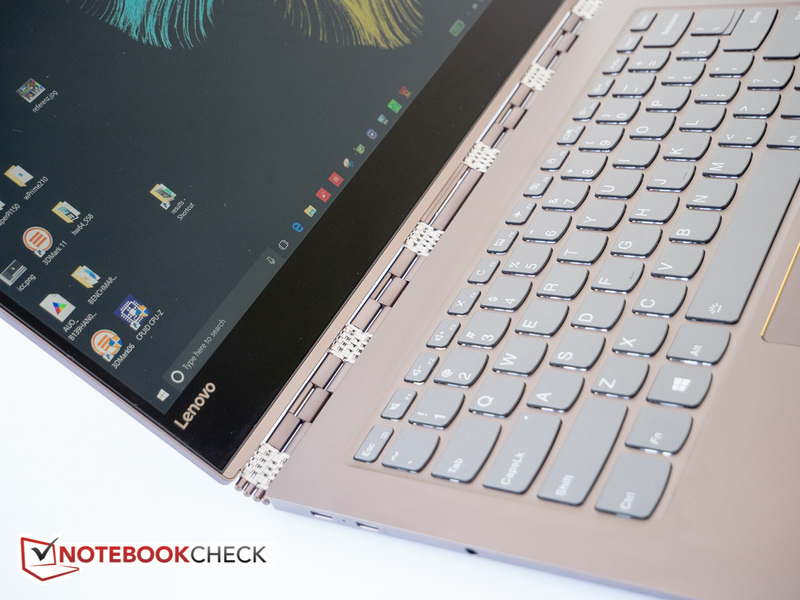 As such, the Yoga 910 with its flexible usage modes certainly struck the right balance between portability, performance and usability. 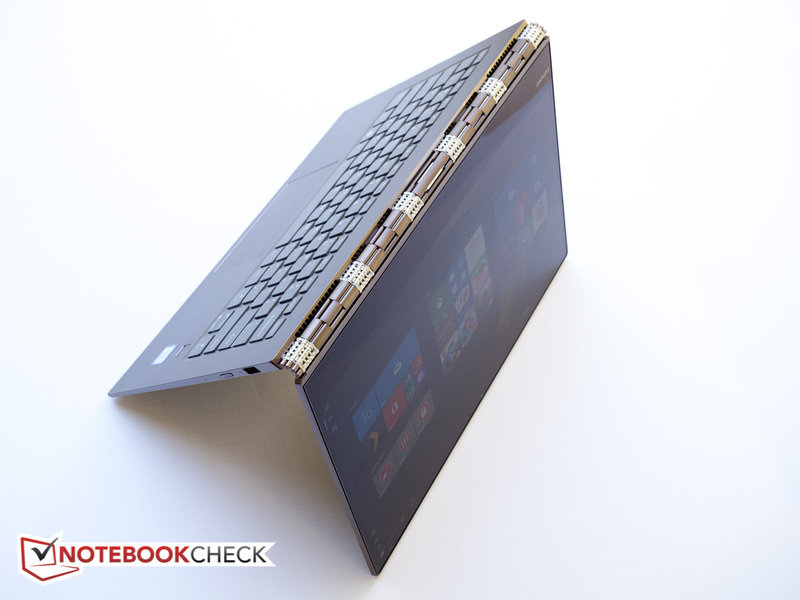 While visually not all that different, the 2017 Yoga 920 actually features a slightly redesigned aluminum chassis with a new bronze color option and ups the ante on the hardware side with Intel Kaby Lake R quad-core processor, twin Thunderbolt 3 ports, and Active Pen 2 support. The 8 GB version with 8th-generation Core i5 processor and 13.9-inch FHD IPS starts at $1330 at the time of writing, but the highest-end SKU with i7 CPU and UHD (4K) display comes with a hefty $2000 price tag. 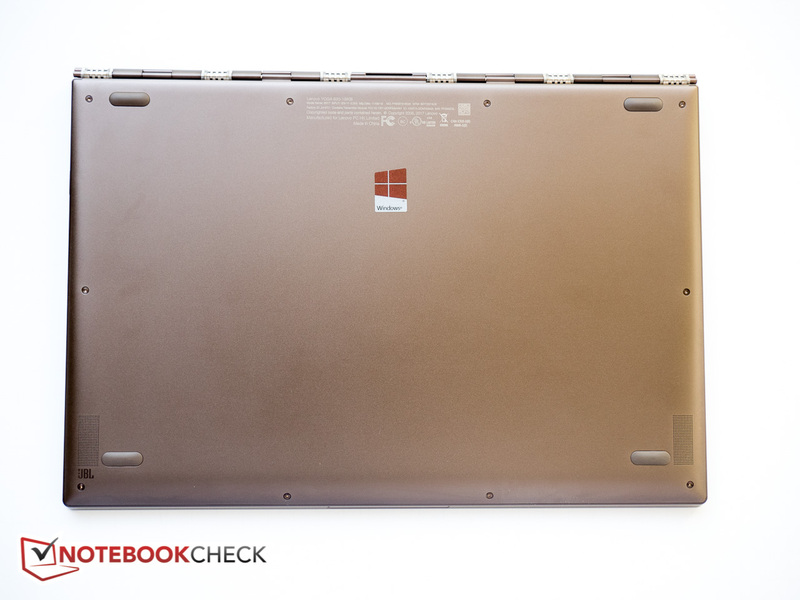 Most users in the market for a 2-in-1 design to replace their aging laptop and possibly a tablet at the same time are likely also going to look at the venerable Spectre x360 13 - we've reviewed both the Spectre x360 with FHD as well as a the Spectre x360 4K model - or competitors like the Dell XPS 13 2-in-1 and the Asus ZenBook Flip S.
The semi-unibody chassis is crafted from aluminum which not only looks very elegant, but also makes for a very sturdy design. Case rigidity is very good and flex is fairly minimal when twisting with no annoying creaking sounds. 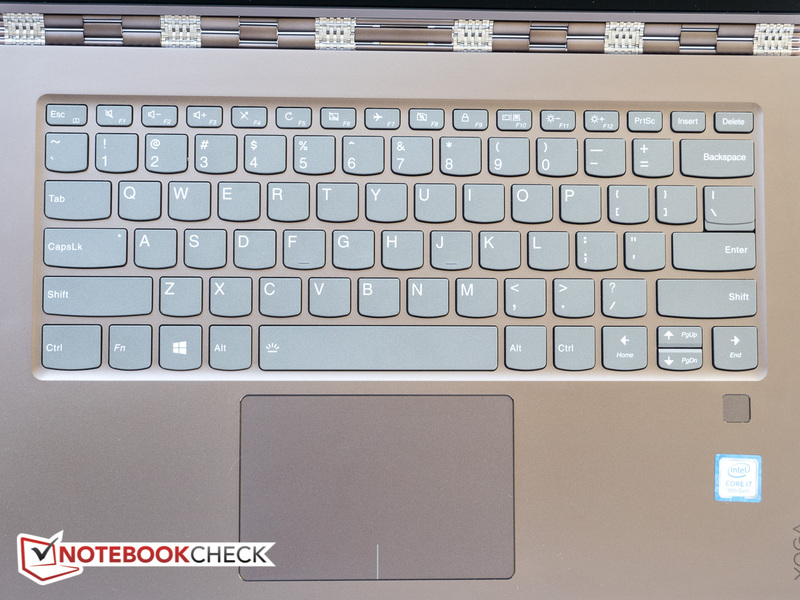 The keyboard deck resists pressure well with relatively minor flexing, although both the Spectre x360 as well as the XPS 13 2-in-1 are slightly more rigid in this area. The glass-covered touchscreen is also very resistant to twists and pressure on the lid does not cause any waves or ripples on the display. The build quality is extremely high as well with tight tolerances and even and narrow gaps around the integrated bottom cover. The brushed surface in Platinum Silver, Bronze, or Copper (depending on the model) resists fingerprints about as well as any material we've ever encountered. The familiar watchband hinge looks very upscale, but we do wish the design was a bit stiffer: as is, the display will tilt backwards when prodded too vigorously during touchscreen operation or when picking the unit up too quickly. Like most consumer convertibles, there are no rubber strips or bumpers protecting the edges when in tent or stand mode, so care needs to be taken on any surface that's not buttery smooth to avoid unsightly scuffs and scratches. The fingerprint reader on the right side of the touchpad allows password-less logins using Windows Hello. Fingerprints are recognized instantaneously as long as the fingers remain clean and dry. 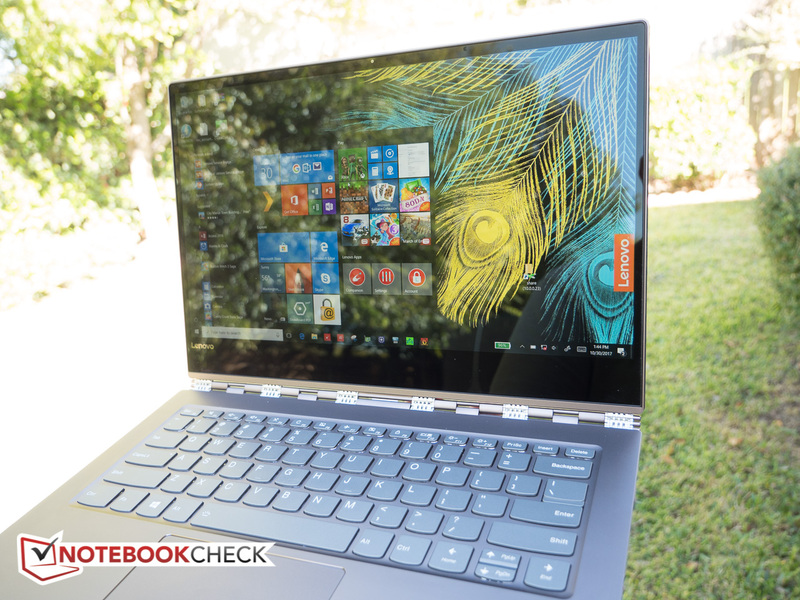 Since the 13.9-inch Yoga 920 features a larger display than its immediate competitors, it's footprint is larger as well - to the tune of more than 15 percent when compared to the 13.3-inch XPS 13 2-in-1 with the InfinityEdge bezel design. 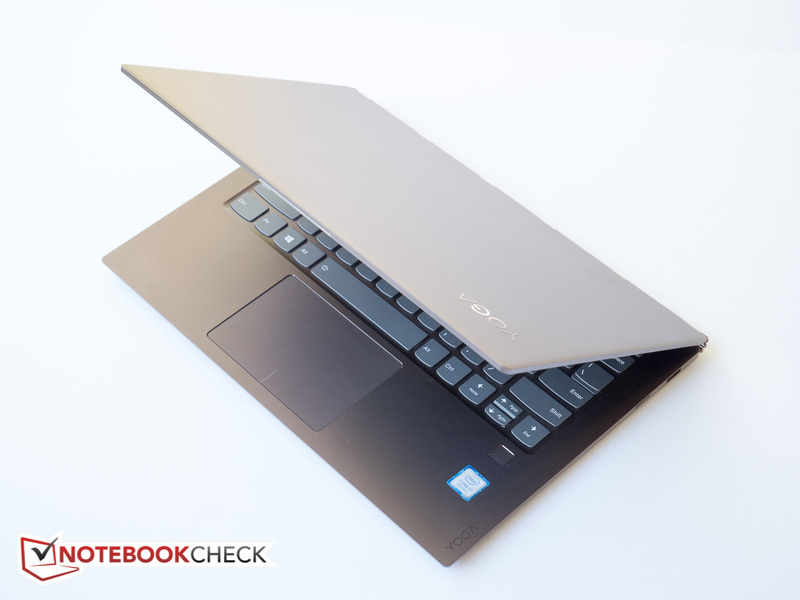 At just under 14 mm, the Yoga is marginally thicker than the XPS 13 or the Spectre x360 with the Asus ZenBook Flip S coming in at a razor-thin 11 mm. The additional size translates to more weight as well, so the Yoga is also up to 250 g heavier than its consumer-oriented competition. 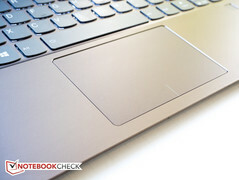 The business convertible Dell Latitude 5289 has a much smaller 12.5-inch display, however, but is only one ounce lighter. Smaller is better when it comes to tablet operation, so the Dell XPS 13 2-in-1 is a little easier to hold - at least in our opinion. Since the edges of the Yoga are fairly sharp, prolonged operation in tablet mode tends to get uncomfortable after a while. 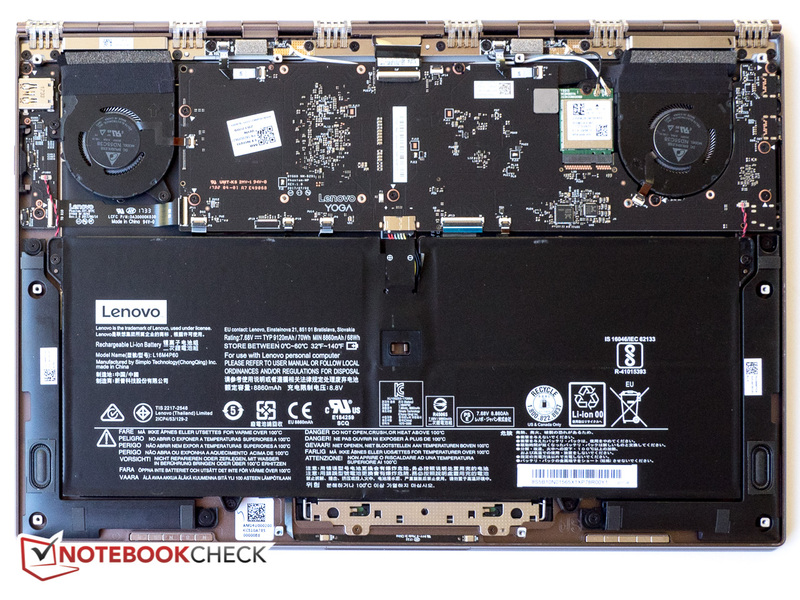 One of our complaints about the predecessor Yoga 910 was the rather poor port selection compared to its immediate competition. 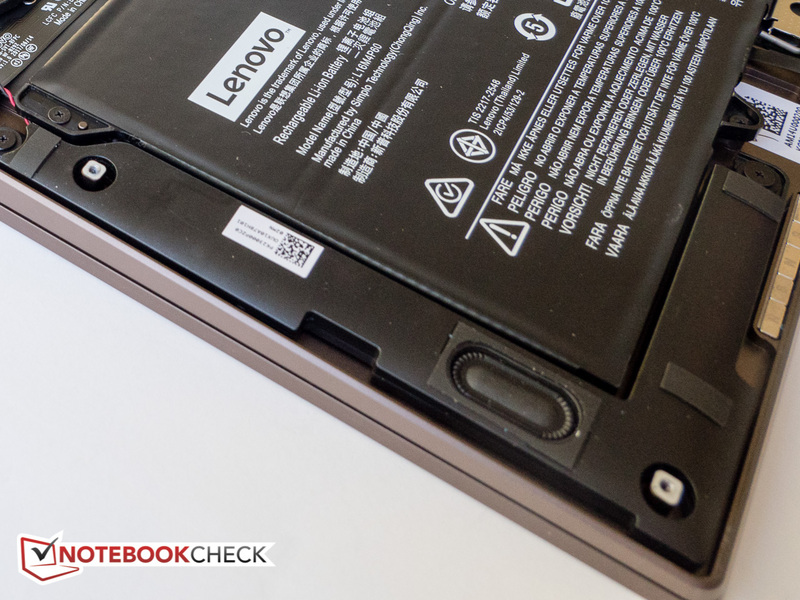 While the Yoga 920 doesn't improve upon the number of physical ports, Lenovo at least has elected to replace the two USB Type-C ports (one of them actually only supported USB 2.0 speeds) with dual Thunderbolt 3 ports. The two ports of course support DisplayPort as well, but most users will have to purchase adapters to hook up to their existing hardware, as there are no designated video outs. When charging, one of the ports is occupied by the power adapter, so for home operation, a dock might be a desirable option. Note that the convertible lacks a card reader as well, so users wanting to look at their vacation photos need to purchase a suitable external reader. The WLAN module from Qualcomm/Atheros (QCA6174) supports IEEE standards 802.11 a/b/g/n/ac on both the 2.4 and the 5 GHz band has Bluetooth 4.1 on board as well. We measured rates of 648 MBit/s and 566 MBit/s for sending and receiving, respectively, when we placed the review convertible one meter from our reference router Linksys EA8500. These transfer rates are very good and both transmits as well as receives are clearly faster than those of the Dell XPS 2-in-1 with its Intel 8265 module. 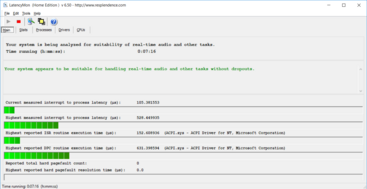 While we didn't experience unintended disconnects during operation, the WLAN module frequently didn't recover from standby, requiring a restart to bring it online again. We suspect a driver issue, though a reinstall didn't fix our issue. The box only includes the convertible, the AC Adapter, and various pamphlets. Our review 2-in-1 also shipped with the Active Pen, which isn't included though with any of the SKUs on Lenovo's website. 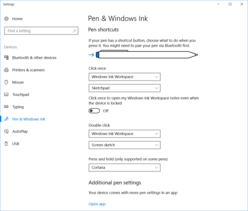 The Active Pen 2 is available as an accessory and sells for $60. The Yoga 910 had its camera below the display in the lower bezel - much like the XPS 13 - which lead to less-than-flattering views while video conferencing. Lenovo sourced a different camera module and placed it in the traditional position up top - and did so without having to widen the bezel at all. 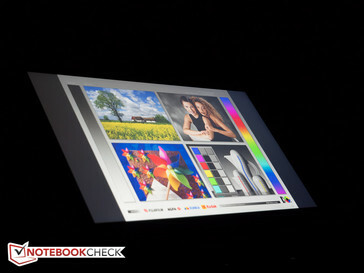 Note that the picture quality is not great with high amounts of noise even in a comparatively well-lit environment. Still, most will appreciate the new camera location, even if the picture quality is far from perfect. Access to the inside is not overly difficult even though this is a convertible and requires taking off the bottom plate, which is secured with 10 Torx screws. 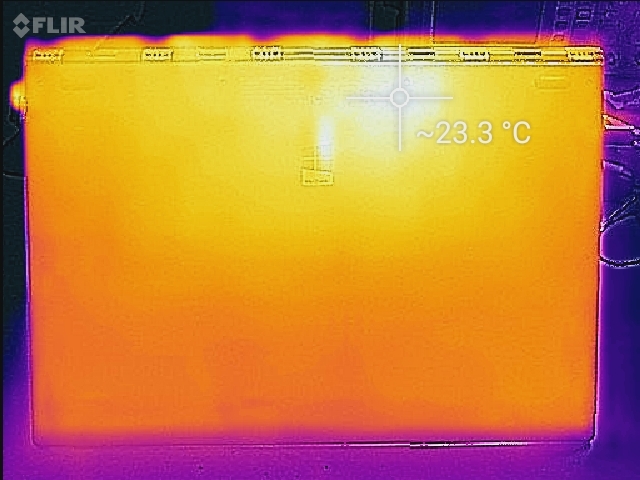 Both the RAM as well as the SSD appear to be soldered on - at least there's no apparent access to either without further disassembly - so maintenance tasks are restricted to replacing the WLAN module or cleaning the two small fans units. The base warranty - either Depot or Carry-in - covers the convertible against defects for a period of one year. Upgrades are very reasonable: a 3-YR Depot warranty with ADP (Accidental Damage Protection) costs $150, the same coverage with On-Site instead of Depot service sells for $180. Please see our Guarantees, Return Policies & Warranties FAQ for country-specific information. 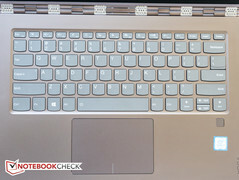 Lenovo decided to increase the size of the right shift key as user feedback indicated that typists generally prefer a full-sized shift key over larger directional arrow keys. While we agree that a small shift key can hamper typing speeds, we are not a particular fan of the cramped, but now very common arrow key design. 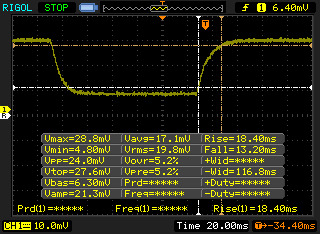 That said, the keyboard itself hasn't changed and flex is extremely minimal, so typing is possible at a very decent clip despite the fairly shallow key travel of slightly less than 1.5 mm according to our measurements. 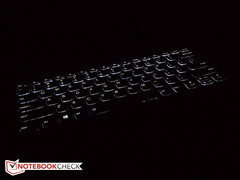 The keys are comparatively stiffly sprung, however, so the tactile feedback is ample and the convertible remains unobtrusive while typing - only the space bar is slightly little louder than the remaining keys. 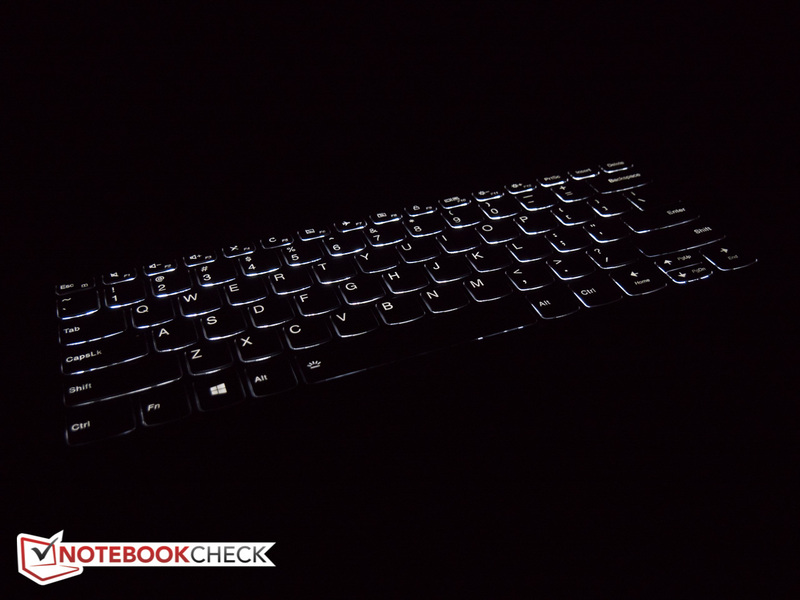 Overall, the keyboard is very usable and quite comparable to what you would find on the Dell XPS 13 or maybe the Spectre x360, although it can't quite measure up to a Thinkpad keyboard with its curved and concave key surfaces when it comes to touch typing. 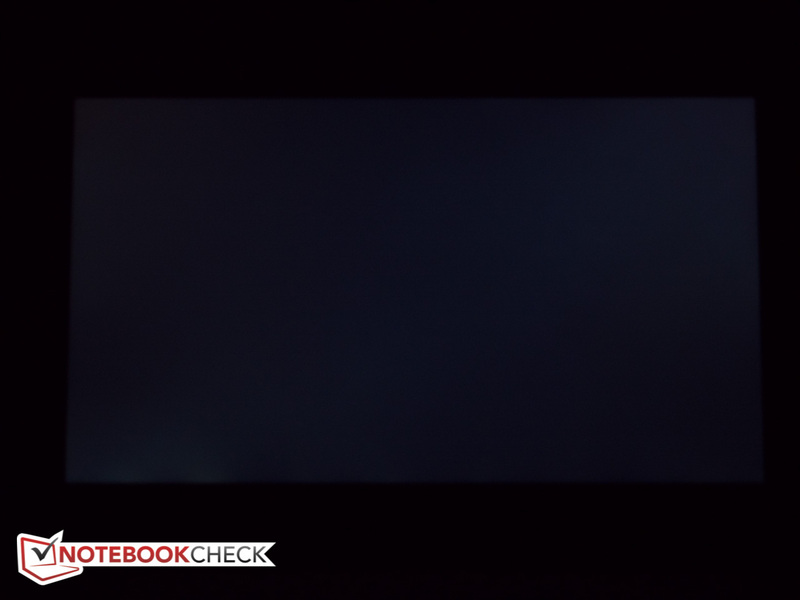 A two-stage backlight allows the Yoga 920 to be used in darker environments as well. 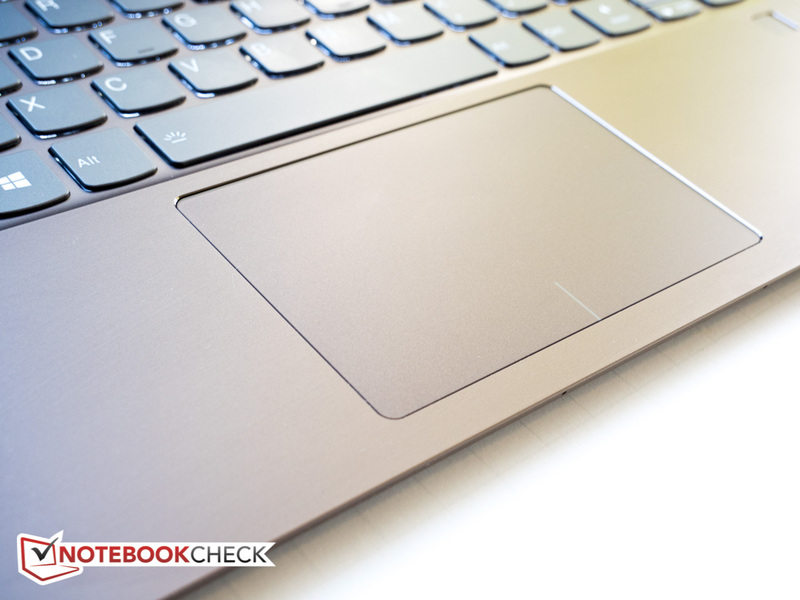 At 10.5 x 6 cm, the clickpad is reasonably-sized and offers great surface gliding characteristics. Control is smooth and the response immediate without any jumping even when moving the cursor slowly or performing drag & drops or gestures with up to four fingers. 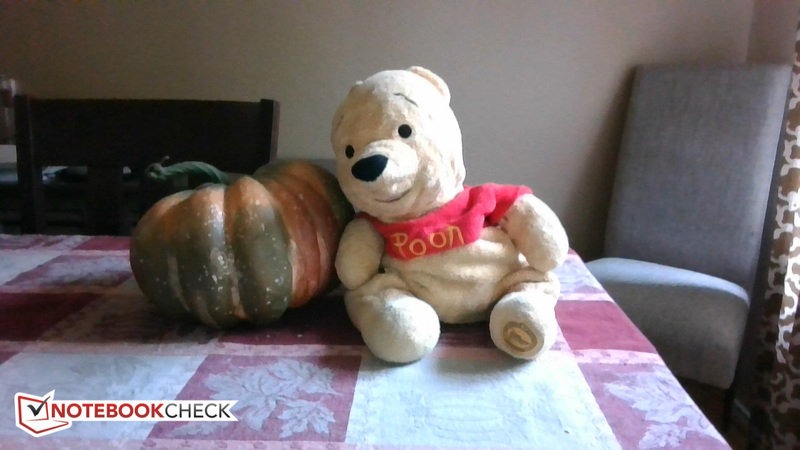 Mouse button clicks are characterized by a short travel distance, but offer plenty of tactile and auditory feedback. Overall quality of the touchpad is certainly acceptable and many users likely won't miss an external mouse too much when traveling. The touchscreen with its narrow bezel supports 10-finger inputs and works very well even at the edges and the corners. Inputs are translated quickly and precisely, although we once again would prefer a slightly stiffer hinge to reduce wobbles during operation. 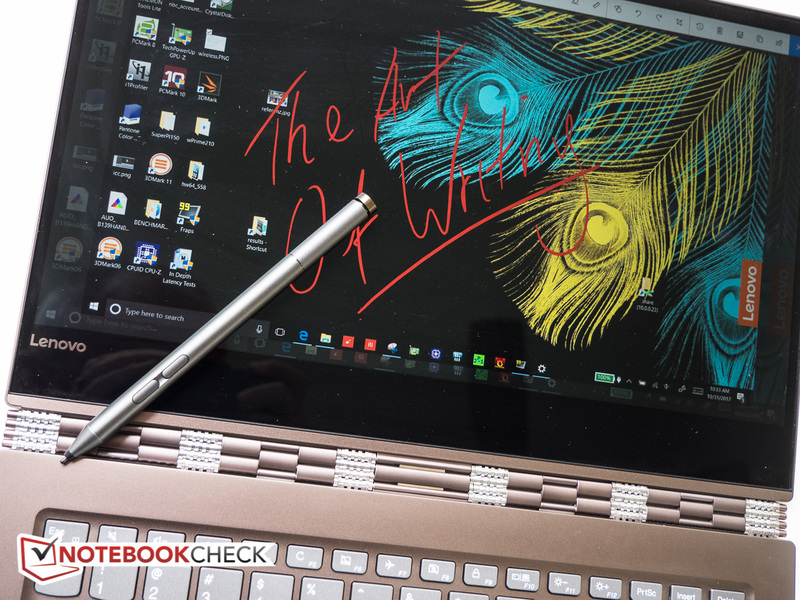 The Yoga 920 now also includes active pen support, which is a first in the series. 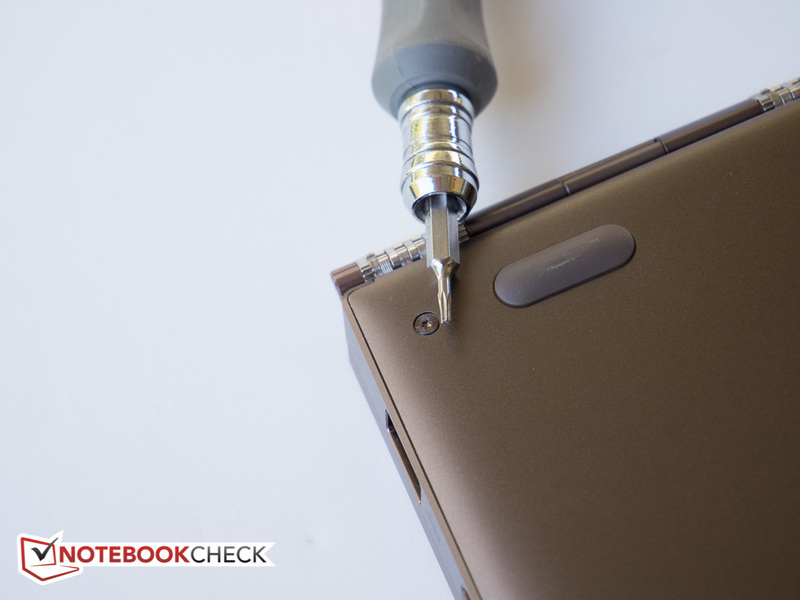 The Active Pen 2, as Lenovo calls their stylus, recognizes up to 4096 levels of pressure and makes the convertible that much more useful. 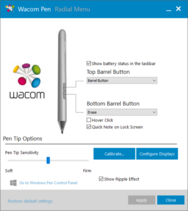 The top and bottom barrel buttons can be configured using the Wacom Pen application; the top button - which is initially used to pair the pen - requires using the Pen & Windows Ink app. The pen is a pleasure to use and we found it equally suited to taking notes as well as as drawing and sketching. Included with the pen is a small holder which plugs into the USB 3.0 port on the right. Note that the Yoga 920 doesn't employ Lenovo's own Lift'n Lock feature like the ThinkPad Yogas, so clicking various keys and the touchpad is unavoidable when handling the convertible. 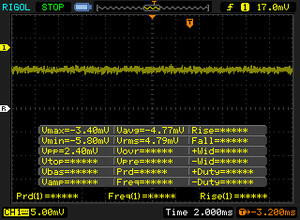 Inputs are of course disabled when the lid is flipped around. 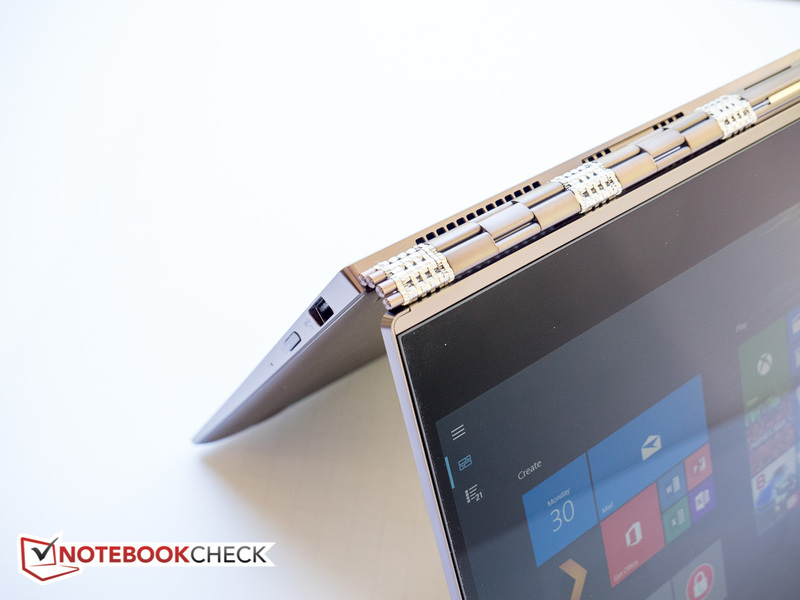 The Yoga 920 is also equipped with four far-field microphones, so it's possible to interact with Cortana from across the room to set reminders, make lists or search for answers on the Internet. The setup works quite well, although we likely wouldn't leave the laptop running all day simply to give it voice commands. 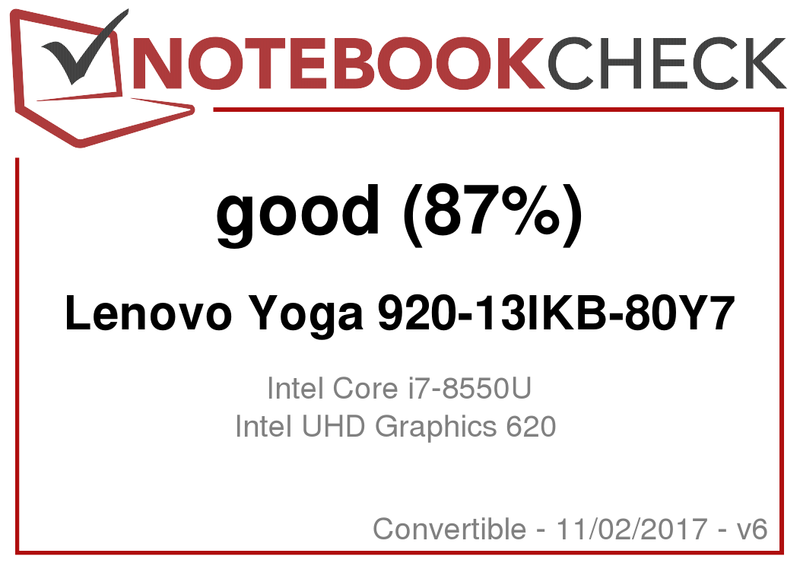 While the Yoga 910 we reviewed last year came with a 4K display, our Yoga 920 features a "regular" Full HD 1080p IPS panel from AU Optronics. With an average brightness of about 280 nits, the panel is reasonably bright, but can't quite measure up to many direct competitors, which reach around 320 nits. The brightness distribution is also quite poor at 81 percent, although the screen is not lit noticeably uneven during normal use. Lenovo doesn't use PWM to control the brightness. 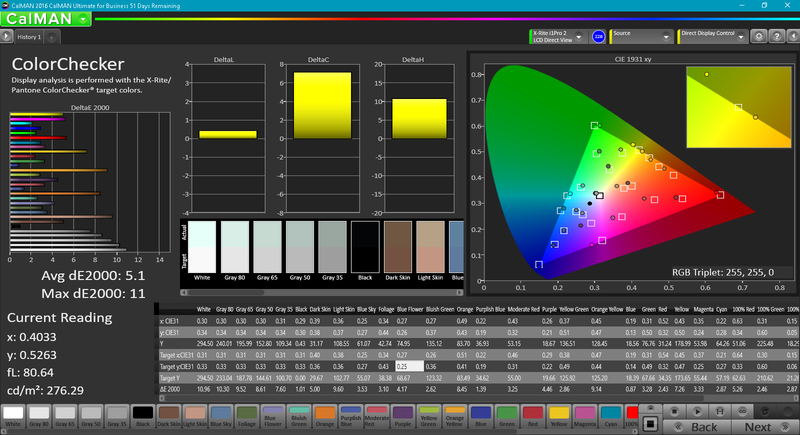 Color space is approximately 64 percent and 92 percent of the AdobeRGB and sRGB standards, respectively, which is comparable to other competitors save for both Dell convertibles, which fall way short in this area. The HP Spectre x360 13-ac033dx with the 4K panel on the other hand has a wider gamut and reaches 97 percent of the sRGB color space. 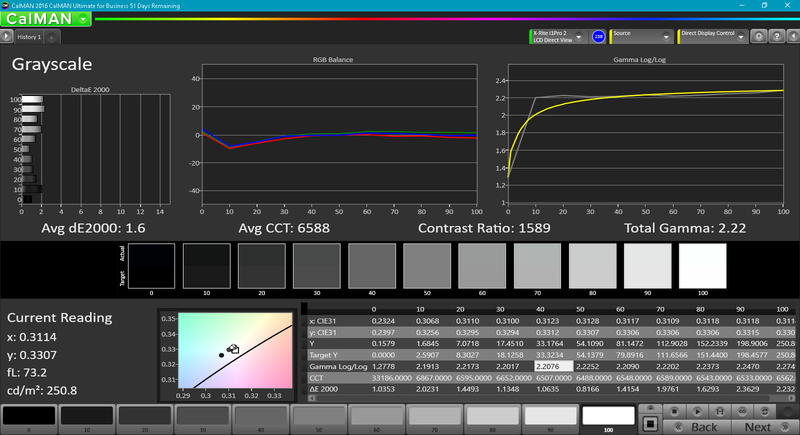 Our X-Rite spectrophotometer measurements reveal a below-average average grayscale out of the box with slightly inaccurate colors particularly at lower saturation levels. 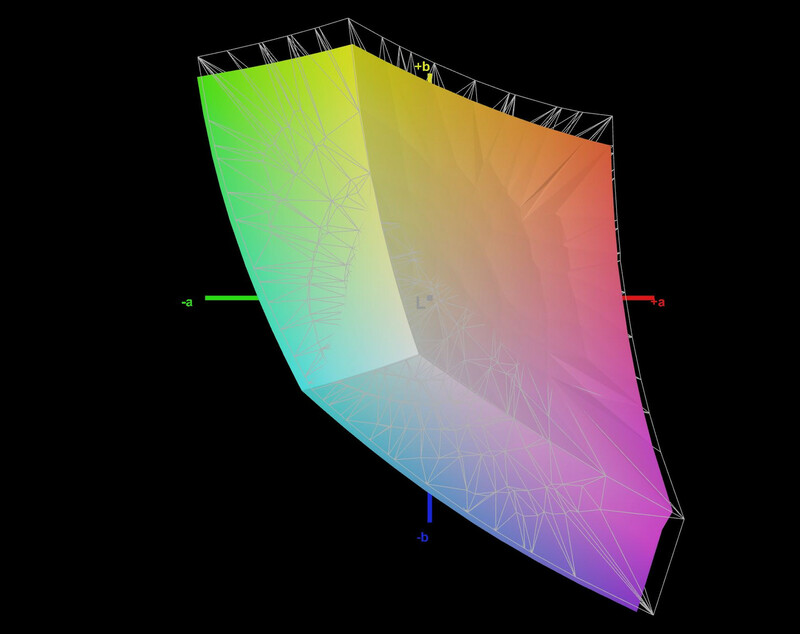 A calibration improved the color accuracy as well as grayscale significantly and also more or less doubled the contrast (we double-checked to be sure with identical results), which is highly unusual. The likely culprit is the poor grayscale performance before calibration. 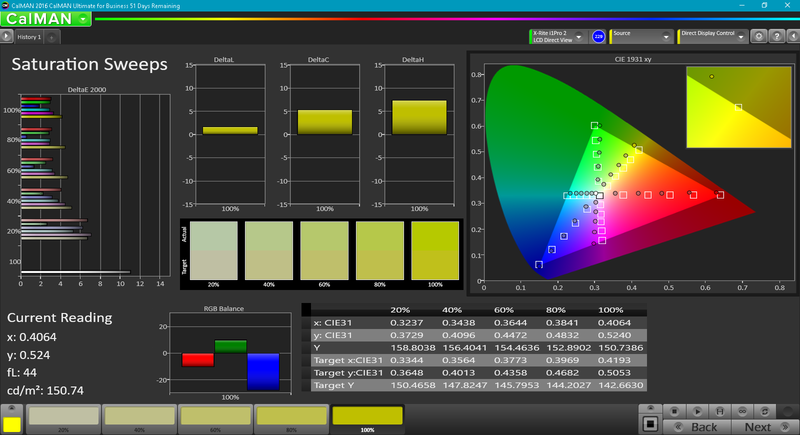 Overall the display does its job well enough, although a calibration is highly recommended. Outdoor usability isn't all that great since the average brightness of 280 nits isn't quite able to overcome the reflections of the glare-type glass panel. Working in the shade is certainly possible in all modes, but tablet mode in particular suffers when walking around in direct sunlight or even under cloud cover. 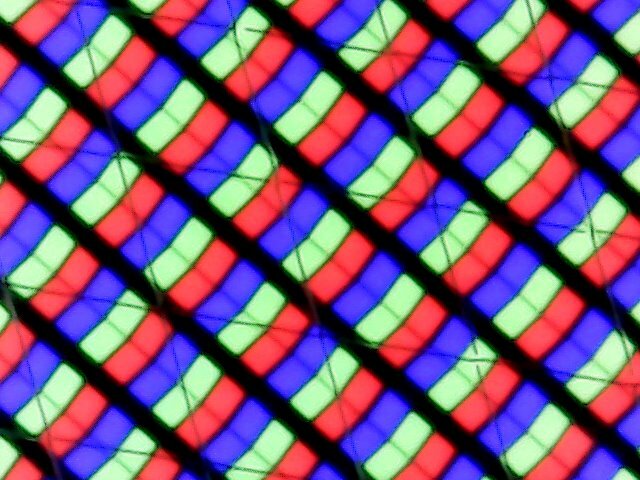 Since the panel makes use of IPS technology, the viewing angles are very wide without color shifts or significant darkening. 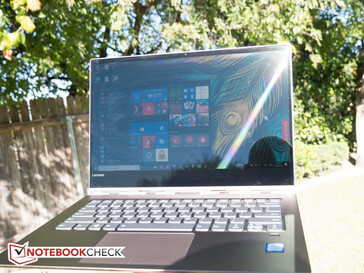 Lenovo not only redesigned and updated the chassis, but also upped the hardware with quad-core Intel Core i7-8550U (4x 1.8 GHz - 4.0 GHz), while last year's version was equipped with the Kaby Lake dual-core Intel Core i7-7500U (2 x 2.7 - 3.5 GHz) . 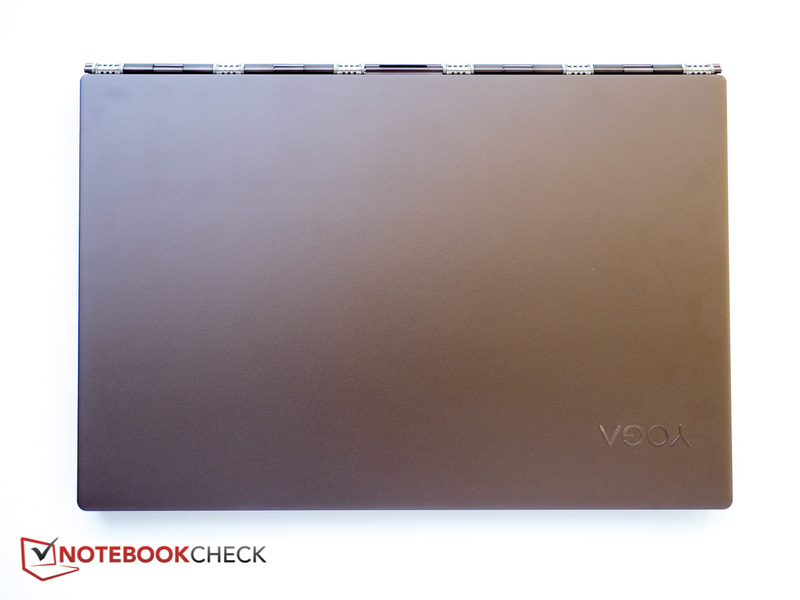 The lowest-end model available as of this writing comes with i5-8250U Processor. The RAM (either 8 or 16 GB) is soldered onto the motherboard and is thus not user upgradeable. PCIe SSDs range in size from 256 GB up to 1 TB. 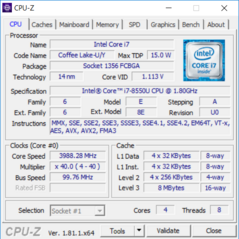 The change from the predecessor with 7th-generation dual-core Intel Core i7-7500U is pretty substantial from a performance standpoint, as the quad-core Intel Core i7-8550U is significantly more powerful. Single-core performance is up at least 15 - 30 percent; while multi-core performance is up from 50 - 70 percent. Note that declining Turbo Boost clock rates have en impact even during a single benchmark run. Case in point: when running the entire Cinebench R15 benchmark, we recorded a Multi-Thread score of 535 points. While quite impressive in its own right, running just the Multi-Thread test of the benchmark without running OpenGL portion first results in an even higher score of 576 points. The same behavior can be seen when running our Cinebench R15 loop test: after the initial score in the 570-point range, subsequent scores are about 40 points lower. Note that after about 25 passes, we see cyclical throttling with immediate rebounds. 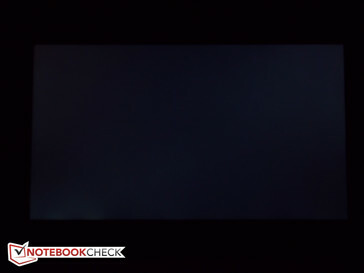 Even so, the lowest score of 494 points in this sequence is still at least 35 percent higher than what we could expect from the i7-7500U on a good day. The Dell XPS 13 with QHD display and the same CPU - we've added the system to the table below for comparison purposes even though it's not a convertible - outperforms the Yoga 920 when it comes to both raw as well as sustained multi-core processing power. 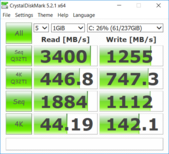 A fast CPU paired with an extremely well-performing SSD at "only" Full HD resolution: the Yoga 920 flies through the PCMark benchmarks and all but trounces most of the competition with previous-generation hardware, although the Spectre x360 with Core i7-7500U - which is an extremely well-performing system - comes quite close. Even some gaming systems with quad-core 45 W CPUs and dedicated GPUs have a hard time pulling away from the review 2-in-1 when it comes to the synthetic PCMark benchmark scores. We experienced no driver or software related issues during the review period. 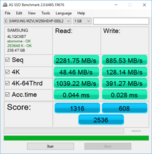 To call the 256 GB Samsung PM961 PCIe NVMe drive merely "fast" is almost doing it injustice. 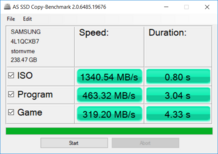 Competing systems with the older Samsung PM951 and especially notebooks equipped with SATA-based drives like the Asus ZenBook Flip S UX370 are slower - sometimes significantly so. 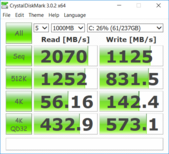 Only the HP Spectre x360 13-ac033dx, which happens to be equipped with the same drive, is a little faster in some and slower in other areas. Suffice to say that the drive will hardly be a bottleneck during program launches, data transfers, or during startup. When running 3DMark benchmarks, our review system either slightly lags behind the Dell XPS 13 equipped with the same processor and UHD Graphics 620 (3DMark 11) or outperforms it by a slim margin (Fire Strike, Cloud Gate, Ice Storm). Systems with the HD Graphics 620 can be up to 30 percent slower depending on the subtest, although the margin is not always all that large. The passively-cooled Dell XPS 13-9365 2-in-1 with Intel HD Graphics 615 is at a disadvantage and over 20 % slower according to 3DMark 11. Gaming performance follows suit in that it is generally slightly ahead of systems with the older CPU and Intel HD Graphics 620. Still, at the native resolution and full details, even older games are generally unplayable. An entry-level dedicated GPU like the Nvidia MX150 in the HP Envy 13-ad006ng offers much higher performance and at least double the frame rates. 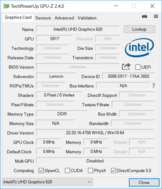 For technical data and additional benchmarks please check our review of the Intel UHD Graphics 620. 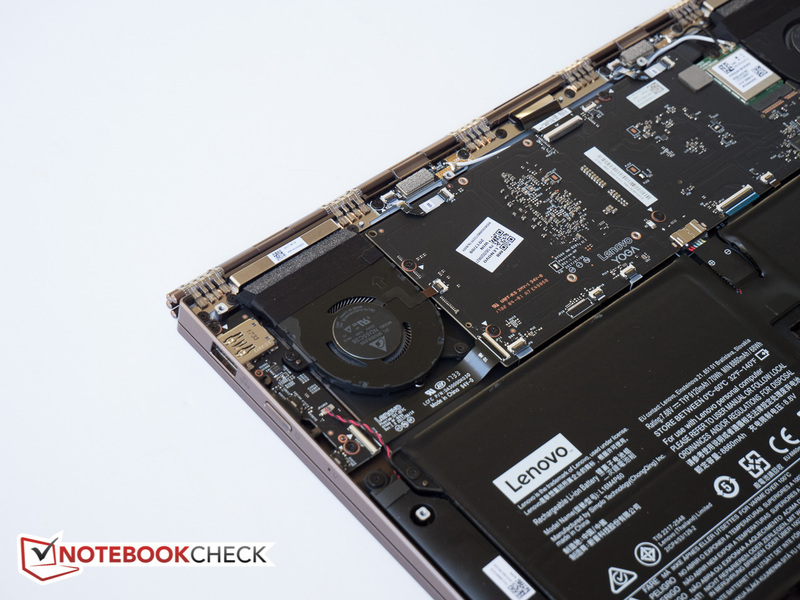 We stress the notebook with synthetic benchmarks to reveal throttling or stability issues. When under Prime95 load, the CPU cores drop from the initial 4 GHz to 2.3 GHz at a temperature of 65 C within 10 seconds. Temperatures slowly climb over the next 30 minutes to between 71 - 74 C with the CPU clock fluctuating between 2.2 - 2.3 GHz average with no further changes occurring. 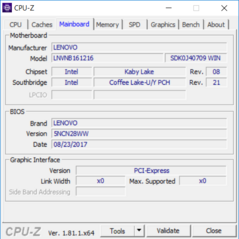 The observed clock rates and temperatures are quite different from the Dell XPS 13 with the same CPU, which stabilized at 2.5 GHz and 92 C. Lenovo seems to be more conservative here, which also explains the somewhat lower CineBench scores of the review convertible. Note that even after a full hour, we didn't encounter the peculiar fluctuations we recorded at the later stages of the CineBench R15 loop test. 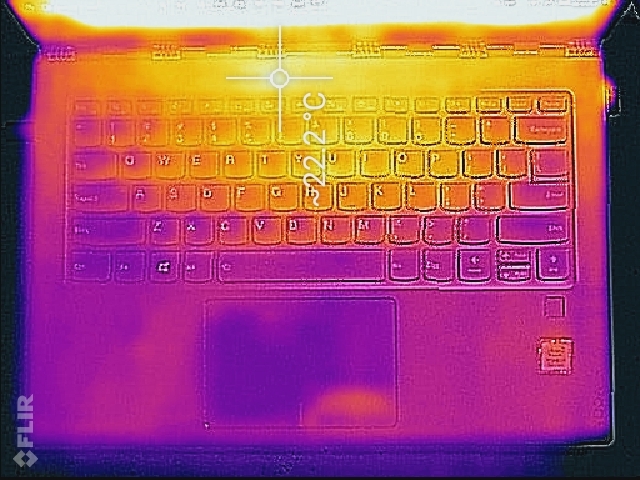 Furmark on its own has the GPU running at exactly 748 MHz with the temperature remaining under 75 C at all times. 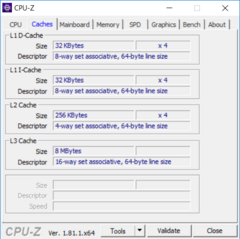 Simultaneous CPU and GPU stress doesn't affect the GPU speed at first, but the CPU drops to 1.2 - 1.3 GHz at a temperature of about 70 C. At around 15 minutes, the CPU remains between 1.1 - 1-2 GHz with the GPU now maintaining 700 MHz without any temperature changes occurring. 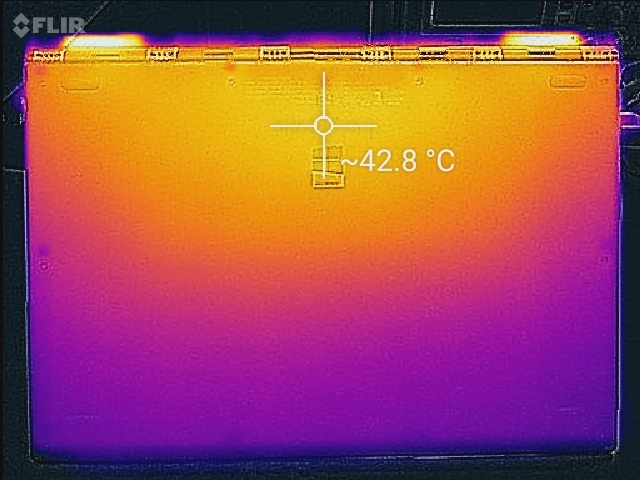 Once again, the Yoga 920 throttles slightly more here than the XPS 13 (GPU: 998 MHz, CPU 1.4 GHz, temperature 84 C) and temperatures are consequently much lower as well. A repeat of 3DMark 11 on battery shows nearly unchanged GPU and CPU performance with Physics and Graphics scores within a couple of percent of our previous run and thus a near-identical final score. The Lenovo Yoga 920 isn't a very noisy system. During idle and simple tasks like word processing, the system remains inaudible at just a couple dB above ambient; average (3DMark06) as well as high loads (Prime95 + Furmark) bump the fan noise to a maximum of only 34 dB. 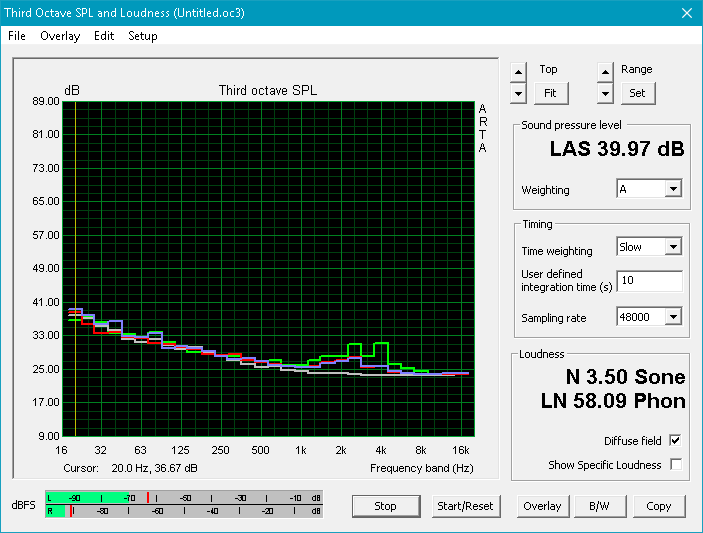 Most competitors are louder, so the convertible is well-suited for quiet environments. Even during the stress test, we never found the fan noise to be overly annoying. The Dell XPS 13 2-in-1 with Intel Core i7-7Y75 remains uncontested, as it is is passively-cooled and hence absolutely noiseless. Our review 2-in-1 also doesn't suffer from any coil whine, which seems to affect a lot of systems lately. During idle, the Yoga 920 stays remarkably cool with nearly flat temperatures across the chassis thanks to the aluminum construction. Even at maximum load, the convertible doesn't exceed 41 degrees on the bottom left and right, so it's still possible to work with the Yoga in the lap without major discomfort. 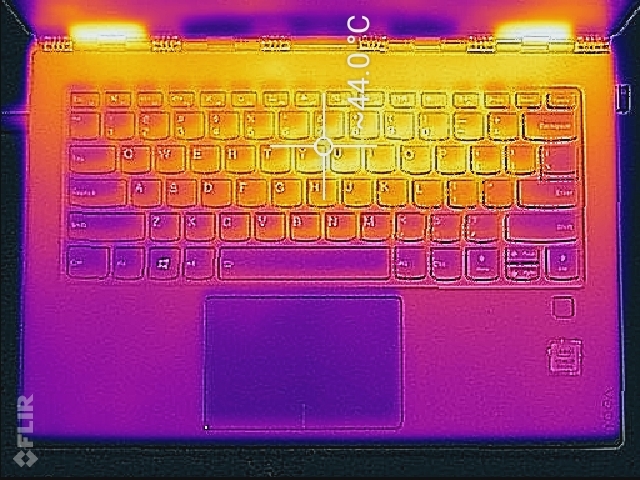 Keyboard temps in the middle are a bit high at 44 C, but the palm rests remain comparatively cool at about 32 C, so sweaty palms are rarely an issue unless the system is subjected to unrealistic loads for extended periods of time. (±) The maximum temperature on the upper side is 44.4 °C / 112 F, compared to the average of 35.4 °C / 96 F, ranging from 21.8 to 55.7 °C for the class Convertible. (+) In idle usage, the average temperature for the upper side is 20.8 °C / 69 F, compared to the device average of 30.3 °C / 87 F.
(-) The average temperature of the palmrest area of similar devices was 29 °C / 84.2 F (-2.8 °C / -5 F). Sound quality is decent given the overall size and modest thickness of the convertible. The speakers, which are located towards the front on the left and right edge, fire downwards and produce well-balanced mids and highs. Voices in particular are clear and easy to understand. Although the bass drops off rather rapidly below 250 Hz, there's a good amount of balance between the lower and higher frequencies. Headphones are still recommended when listening to music, however. Note also that the perceived output changes slightly when the 2-in-1 is used in tent or stand mode since the sound doesn't get reflected from a surface any longer. 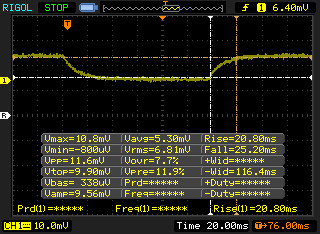 Idle power consumption ranges from 3 - 7 W and is comparable to other subnotebooks. 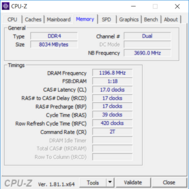 At medium (3DMark06) and maximum (Prime 95 + Furmark) loads, the convertible draws about 20 percent less power than the Dell XPS 13 with the same i7-8550U CPU. Note that the average and maximum are near-identical because of throttling. Still, it's important to remember that this situation is unlikely to occur during normal use. The AC adapter is rated for 65 W and has more than enough capacity to handle the encountered loads. Runtimes have improved over the predecessor even though the battery capacity is slightly smaller (70 vs. 78 Wh) and are only matched by the 12.5-inch Dell Latitude 5289 with i5-7300U CPU and the passively-cooled Dell XPS 13-9365 2-in-1 with the i7-7Y75 CPU. Real-world WLAN use is almost 11 hours and 30 minutes, which is outstanding and more than sufficient for an entire workday. We should mention here that the Yoga 920 also has one of the largest batteries, so the longer runtimes are not totally unexpected. The new and redesigned Yoga 920 is the best 900-series Yoga yet and far from just a simple hardware update. Performance is certainly up with the new quad-core CPU and the blazingly-fast NVMe SSD, but Lenovo also improved other areas: the new convertible now sports 2x Thunderbolt 3 ports, an improved webcam location, a modified keyboard, supports an active stylus for the first time and runs longer on a charge. 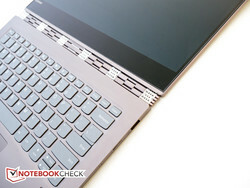 Lenovo obviously took customer feedback to heart, which is refreshing to see. The aluminum chassis is beautiful and quite sturdy as well and the watchband hinge-design still turns heads. The display could be a little brighter though and the contrast ratio and the grayscale accuracy could be better as well. There's also a question of size: the Yoga is still one of the larger convertibles out there, which doesn't make it as easy to hold when in tablet mode. Still, some users might appreciate the extra screen real estate. 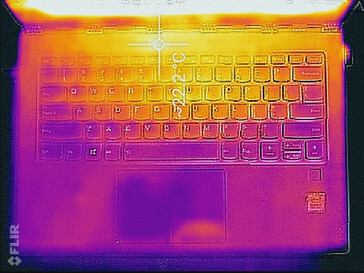 The lack of a "Lift'n Lock" feature a la Thinkpad Yoga also leaves the keys exposed, so extra care needs to be taken to avoid damage. The throttling under heavy load curtails the huge performance potential of the extra CPU cores a little, but the overall performance is still up, so we wouldn't consider that a huge drawback. 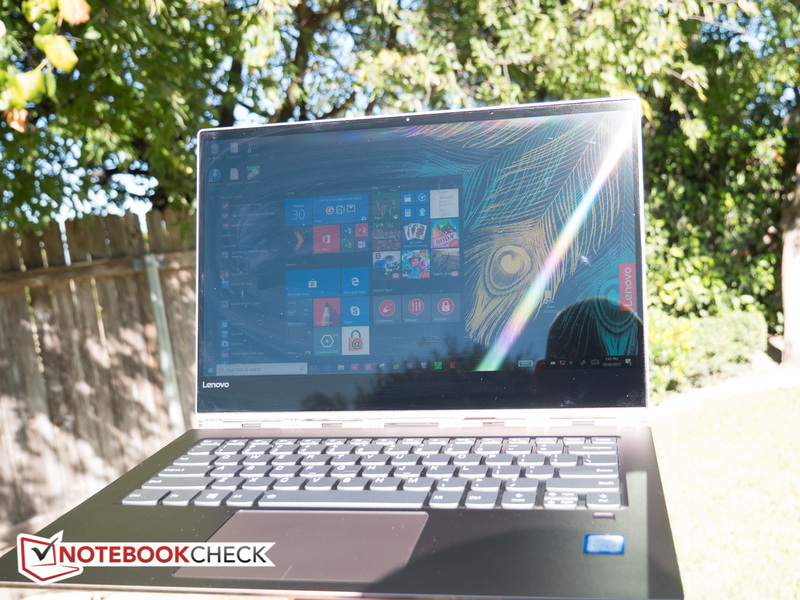 One additional plus: the annoying whistling sound we encountered during our review of the predecessor Yoga 910 is definitely no longer an issue. The Yoga 920 is a very well-designed and attractive 2-in-1. 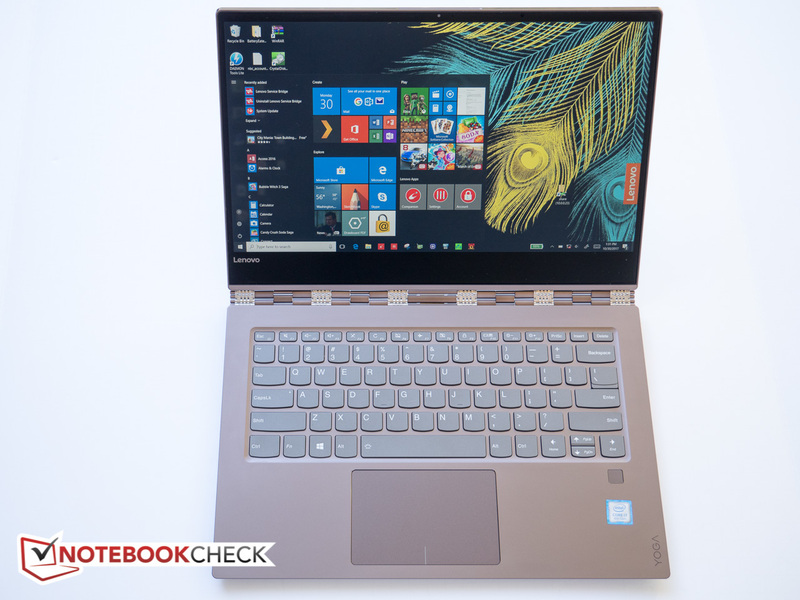 Users considering a 13.3-inch convertible like the HP Spectre x360 or Dell XPS 13 should definitely take a look at the slightly larger Yoga as well.